Faith Hope CharityThe distinguishing characteristics of a Freemasons heart Want to be a Freemason?Find out more about joining Friendship and Harmony Lodge What is FreemasonryIt's about making good men better men. The purpose of this website is to give you an insight into Freemasonry and information about becoming a Freemason in Godalming, Surrey. We welcome the opportunity of introducing you to Freemasonry in general and to the Lodge of Friendship and Harmony No. 1616 in particular. The Lodge of Friendship and Harmony No. 1616 was founded in 1876 mainly by professional people from London, who thought it fitting to be members of a Lodge in the Country. Friendship and Harmony Lodge celebrated its 500th meeting at Godalming, Surrey on 20th May 2010. The first meetings of the Lodge were held in Weybridge to correspond with the locally grown crops of Gooseberries, Raspberries and Cherries! 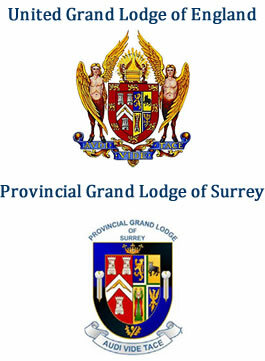 Friendship and Harmony Lodge in Surrey has the unique distinction of having a reigning monarch, and Past Grand Master as one of its members. HRH The Prince of Wales (latterly the Duke of Windsor), who was Provincial Grand Master of Surrey from 1924-1936, became a member of the Lodge in 1924, was Installed as its Worshipful Master in 1935, and succeeded to the Throne – as HM King Edward VIII - while he was still Worshipful Master of the Lodge, prior to his abdication in 1936. Our Freemasons Lodge regularly meets 4 times a year at the Godalming Masonic Centre. We welcome enquiries to join our Masonic Lodge from men from all walks of life. Friendship and Harmony Lodge No1616, Surrey.